Can and Should You Add More Memory to Your PC? One of the easiest ways to boost performance for an older PC is to add memory to the system. But before you go to get that memory upgrade, be sure to gather information about your computer to ensure you get the right memory for your system. It is also useful to know how much would be beneficial without overspending and getting too much. Find out how much memory is in the computer by examining the BIOS or operating system. For Windows, this can be located by opening up the System properties from the Control Panel. In Mac OS X, open up the About This Mac from the Apple menu. This will tell you the total memory but not necessarily how the memory is installed. For this, you might need to open your computer and look at the physical slots. Now might also be a good time to find out if your PC can even be upgraded. Many new laptops, especially the ultra-thin models, do not have any physical access to the memory. If this is the case, you probably will not be able to upgrade and might be forced to get a completely new computer. Check your operating system and application programs. Often they will have a printed Minimum and Recommended memory listing somewhere on the package or in the manual. Find the highest number out of recommended section and try to plan on having this much or more memory by the time you are done upgrading your system memory. I have found that 8GB seems to be the best amount for laptops and desktops. More than this is only useful if you are using very demanding programs. What Type Does Your Computer Support? Look through the manuals that came with your computer or motherboard. Included in the documentation should be a listing of the specifications for the memory supported. This is important because it will list exactly the type, size, and number of memory modules that are supported. Many retailers and memory manufacturers have this information in case you cannot find the manuals. Most systems use DDR3 now and either 240-pin DIMM for desktops and 204-pin SODIMM for laptops but use the manuals or a memory configuration tool from a memory company to double check. Many newer desktops are starting to use the DDR4 memory. It is critical that you know what type you need as the types of memory are not interchangeable. How Many Modules Should I Buy? Typically, you want to buy as few modules as possible and buy them in pairs for the most efficient performance. 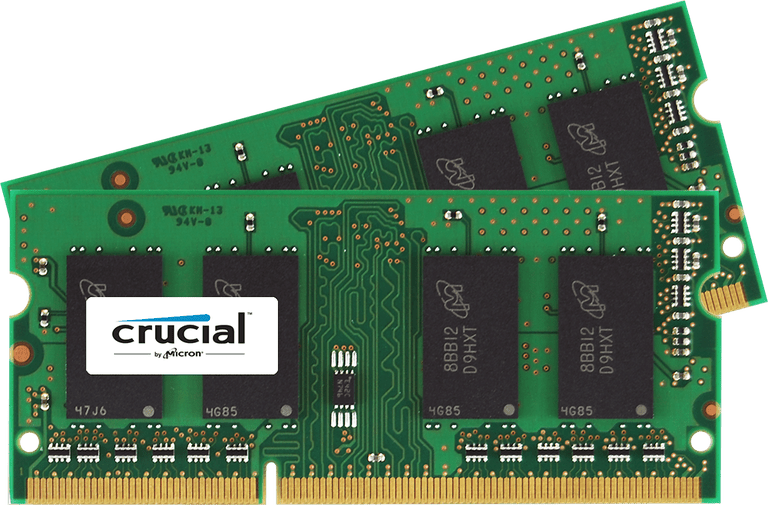 Thus, if you have a PC with four memory slots of which just a single one is used with a 2GB module, you can purchase a single 2GB module to upgrade to 4GB of total memory or buy two 2GB modules to go to 6GB of memory. If you are mixing old modules with new ones, try to match their speed and capacity to try and allow dual-channel memory if your systems supports it for best performance results. Installing memory, or RAM, is one of the easiest things to do for a personal computer. Typically it involves just opening the case on a desktop or a small door on the bottom of the laptop and finding the slots.